Desktop client for JIRA. Track time, upload automatic and manual worklogs without a hassle. Cross-platform. Open-sourced. Your working tool kit. Open a tracker, browse tasks, pick what you want to work on and start tracking. Move it to "Done" when you&apos;ve finished. Without leaving an app. Chronos is also minimalistic JIRA client, where you can perform most needed actions like changing issue’s status or checking it’s details. 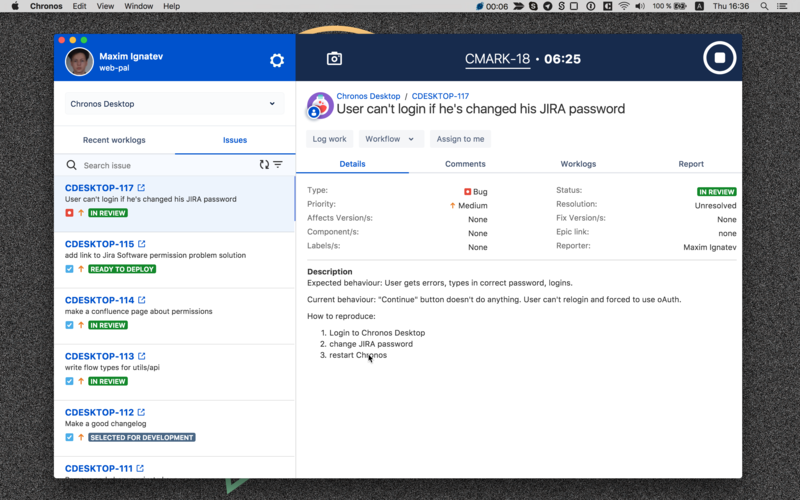 Besides native JIRA worklogs information we provide a lot of data like screenshots, activities, types and comments. You also can add worklogs manually. Code of the project is in public access and hosted on Github. It’s free. If you think our product rocks or just want to support us, check out Chronos Timesheets. JIRA plugin to view worklogs. Watch what your team is busy with, calculate salaries, view screenshots and activity levels. Rich and flexible. To get started you must have atlassian account.